The 1.6 million-acre Mojave National Preserve is only a bit more than an hour by car from Las Vegas, but it is a world apart, offering opportunity for solitude amid sweeping desert views of the east Mojave. Deborah Wall The world’s largest concentration of Joshua trees grows in the Mojave National Preserve, California. A good specific activity there, for this time of year, is the Teutonia Peak Hike. The trailhead is at 5,027 feet — about 2,500 feet higher than Boulder City, so you should anticipate temperatures will be about 15 degrees cooler on the same day. Therefore it’s advisable to take the hike soon, before the winter cold sets in. Also, this can be a windy area so be prepared with a hat and a windbreaker. The hike is about 4 miles round-trip with an elevation gain of about 500 feet, depending on how much rock scrambling you are willing to do. The hike isn’t advised for very small children as there is uneven and rocky terrain in the last section of the trail. This isn’t your classic peak hike up a steep mountain, but rather to the summit of Cima Dome, the summit being a rocky outcropping atop an almost perfectly symmetrical geologic formation that rises 1,500 feet above the desert. Originally, it is thought the formation was an irregular mass of granite pushed above the surrounding surface by surrounding forces, but over an almost unimaginable period of time, wind, weather and further geologic activity rounded it off. The entire dome itself is actually best seen from afar, such as from Interstate 15 outside of Baker. From the signed trailhead, just head up the old and now abandoned road. The walking is fairly flat and easy as you make your way to the dome. A special treat of the hike is passing through a Joshua tree forest, with some of the picturesque trees snaking more than 20 feet toward the sky. 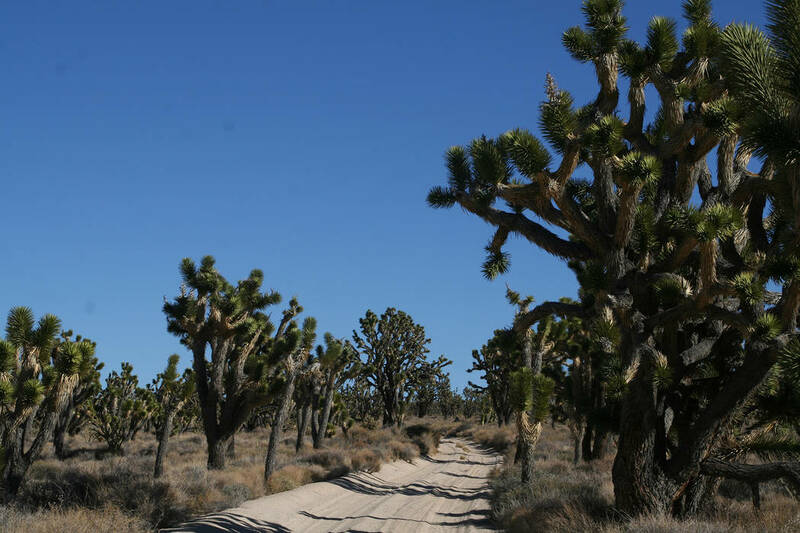 In fact, this area is the largest concentration of Joshua trees in the world. Joshuas usually grow at an elevation between 2,000 and 7,000 feet, in sandy soil on a flat or gently undulating landscape, so they are not a widely distributed tree. Along this trail you will also find other more common desert plants such as Mormon tea, cholla and yucca. About one mile from the trailhead you will be near an area full of abandoned mines. While they are now grated, be careful when exploring these old silver claims. From here you will start to gain some elevation as you hike toward the outcropping. Follow the faint path up as far as you feel comfortable. The actual true summit or peak is hard to access and isn’t worth your while since from the ridgeline the views are just as grand. The panoramic views once on top are spectacular. To the north you can see Clark Mountain, at an elevation of 7,929 feet, the highest peak in the park. This is the prominent peak you approach near Mountain Pass on Interstate 15, but the view from here is much better. To the west and still within the preserve, you can see the cinder cones and lava beds that make up the Cinder Cone National Natural Landmark, designated in 1973. Farther west, with a good pair of binoculars, you can see the world’s largest thermometer in Baker, California, and the outlines of the San Jacinto and San Bernardino mountains. To the south you can see the Kelso Sand Dunes that rise about 600 feet from the valley floor. Visiting these dunes is a great side trip while you are in the park. Also worth a stop is the park visitor center at Kelso. Besides the usual functions of any national park visitor center, this has the charming feature of being built in a former train station on the Union Pacific Railroad. The station was wisely restored to capture the ambiance that prevailed when the iron rails and iron horses were the best way to traverse the Mojave Desert. Adding to the experience are the freight trains that still rush by every hour or so, nowadays behind a secure safety fence but still only a few feet from the station’s front door. From Boulder City, drive 2.5 miles north on U.S. Highway 93 and exit onto U.S. Highway 95 south. Drive 34 miles to Searchlight. Go right onto State Route 164 for 26.5 miles through Nipton, California, and then turn left onto Ivanpah Road. Drive 3 miles and go right onto Morning Star. Drive about 15 miles to Cima. Go right and drive 6 miles to signed trailhead on the left.